Perhaps the greatest advantage of growing up in a suburban home in the southern West Bengal is the abundance of great fresh foods and the faith that grows with it – food is sacred. And when you pair this with a family of traditional food lovers, the result is nothing short of magic. It is therefore imperative that food was as ingrained in our lives as was possible. A lot of our conversations revolved around food. We had our seasonal specials like the sundried raw mangoes marinated in fragrant spices and dipped in mustard oil in summer, or the ripe and juicy plums in a spiced jaggery sauce in winter. The Ilish wrapped in banana leaves and steamed for that smoky flaky texture meant a day of heavy rain and staying inside all day. Those heavenly sweet “pithe” of the fall could make me go weak in the knees. And there was the “bhog-er khichuri” to die for during the Pujas. But not only the specials, our regular meals were most meticulously planned too. Mother spent a significant amount of time each day deciding the next day’s menu while I supplied her with my choices. A typical lunch platter in my home consisted of pearl white long grained rice along with some fries, some greens, a vegetable dish, dhal, one or two types of fishes topped with fresh homemade yogurt and rounded off with something sweet. Each dish cooked differently using different methods to help keep their unique taste and texture while enhancing the flavour and the aroma – home was truly a foodie’s paradise. And my mom – the world’s best cook. But then like all good things, the permanency and safety of home also came with an expiration date. When I had to move to a new city, my mother’s primary concern wasn’t about my living arrangement but about my food. Because even though I loved to eat, I didn’t know how to cook. But oddly, this was liberating, my exile from home exposed me to different types of cuisines, acquainted me with their unique styles of cooking. This was like the Pandora’s box – the stepping stone of my never ending culinary journey – to find myself in the subtlety, to lose myself in the boldness – of tastes. As a result, the new kitchen in my small rented studio in the new city started to represent an eclectic ensemble of everything related to all food that was good. So when my mom was visiting me for the first time in the new city, carrying with her food more than she could carry, I wanted to surprise her with a well-planned meal – foods that I knew would suit her taste buds, yet belonged to a type of cuisine she had never tried before – less to acquaint her with new foods, more to relieve her the worries about my foods. It was not an easy feat to achieve, for I was setting to impress my mother – an incredible cook herself. On the holy day of her arrival, I awoke early. With a blue tote under my arm I went to the local marketplace. Fresh white mushrooms just big enough to pop in mouth, the greenest of the spinach, the green onions, colourful bell peppers with their supple skins, red and juicy tomatoes, the aromatic oranges – the plethora of colourful vegetables – oh so beautiful. They lured me in – take me, take me, they screamed – and soon my bag was overflowing with bright red yellow and green. At my next stop I got the freshest, juiciest soft chicken breasts and jumbo de-veined shrimps. And then on a whim I threw in some yummy soft cream cheese, some tangy cheddar and the crunchy parmesan. Back at home my preparations began. Food always made me joyous and combined with the happiness of seeing mom – my soul was brimming. I hummed with the peppy Bollywood tunes playing in the TV and set to work. I chopped the vegetables, marinated the chicken in flavours of salt pepper lime zest and refrigerated it. I steamed the spinach and let it cool. The olive oil was flavoured with garlic and the shrimps were sautéed till just pink. I mixed the tender shrimps with chilli flakes, chopped ginger, fresh cilantro, steamed sweet corns, shredded carrots, dash of lime juice, soy sauce and little sugar. My shrimp salad was ready. Spicy with just the right level of tanginess. I placed it on a fresh lettuce leaf in a Borosil fluted dish. And sprinkled it with oregano flakes and chopped green onions. The transparent glass was perfect because all the beautiful layers, all the colours were vibrantly visible. I cleaned and dried my mushrooms. The stems of the mushrooms were chopped really finely and sautéed in vegetable oil. I added green onions, onions, garlic, some broken walnuts, and some chilli flakes and fried till they were cooked. Mixing this mixture with cream cheese, parmesan cheese, black pepper I made a thick paste. I filled the mushroom caps with this paste and dipped them in melted butter and lime juice and placed the mushrooms on a rectangular glass dish in a pre-heated oven to bake. In another 30 minutes my stuffed mushrooms would be ready. I sprinkled the chicken with plain flour and fried it till brown. In olive oil flavoured with garlic and sesame seeds, I added the chopped vegetables and sautéed them till soft. In a large mixing bowl brown sugar, honey, soy sauce, hot sauce, fish sauce, chilli flakes, coconut milk and Thai red curry paste were mixed and poured over the vegetables. The rich simmering brown of the sauce mixed with the colourful vegetables made my saliva glands work overtime. The final touch to this already beautiful dish was the addition of the crispy tender chicken pieces. Sweet, spicy, creamy – an explosion of flavours, my fusion chicken in coconut milk was waiting to be savoured. It was nearing 30 minutes so I took out the mushrooms, rich golden now. A few bits and pieces of green onions, parmesan and tomatoes on top for dressing and the perfect appetizer is ready. Placed on a Borosil variety platter it looked even more appetizing. My spinach brownies were even easier to make. In another mixing bowl I combined flour, salt and baking powder, mixed it with milk, egg and butter. In a glass dish I layered this mixture, the steamed spinach, mozzarella and cheddar alternatingly. I baked it for half an hour, took it out and sprinkled with chilli flakes, oregano flakes, dried mixed herbs. I cut them in squares, just like brownies and poured a cheesy sauce over. Crunchy and creamy in layers of tangy cheese – perfect. I placed it in a clear glass dish again, so that the layers of green crunchy spinach and white creamy flour and cheese mix were visible. My last course for the day was Baklava. A Turkish dessert I had tasted the other day and hopelessly fallen in love with. I knew my mom, being my mom, would love it too. Hence out came the baking dish again. I layered it with the paper thin phyllo dough, brushed liquid butter on top, then covered it with the cinnamon-y, sugary, nutty mixture I had prepared the day before, and kept repeating till the layers came up till the half of the dish. I ran my knife to make small triangular pieces and then drizzled with liquid butter. In my oven it went. Meanwhile the syrup of honey, sugar, vanilla and water kept boiling on the stove stop filling the room with its vanilla scent. Once off the stove, I flavoured the sweet syrup with orange zest to give it the fresh orange-y aroma. I knew my Baklava was done when my whole apartment started to smell like the best candle shop in the world. I took it out and poured the syrup on top covering every nuke and corner. Placing all my dishes on my small dining table, I stood back to take a moment and appreciate my own efforts, pat my own back. Beautiful foods, served in beautiful clear glass serving platters made my knees go weak. My stomach grumbled and my mouth filled with water. Not yet, I told myself. Mom would be here soon. 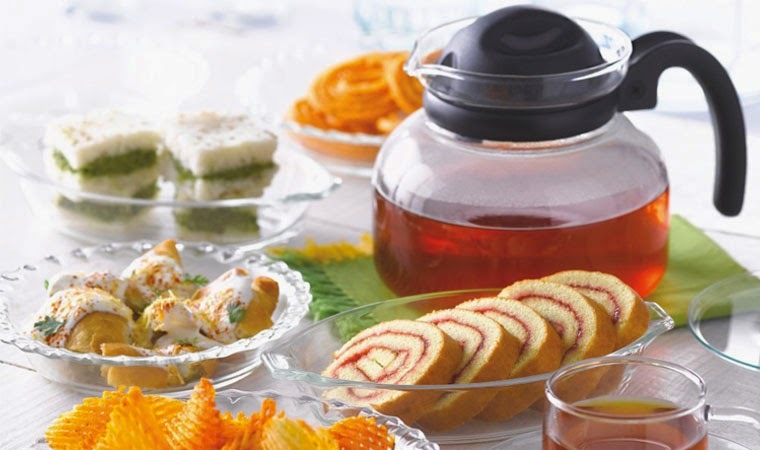 This post is written for the ongoing contest My Beautiful Food in Indiblogger in association with Borosil – a brand synonymous with beautiful glassware. Visit http://www.myborosil.com to shop online. so what did MOM say.. Wow!! My stomach is rumbling now!! Best of luck with the contest! !